This much acclaimed tetralogy published between 1957 and 1960 consists of Justine (1957)m Balthazar (1958), Mountolive (1958) and Clea (1960). In this four vivid novels, the author Lawrence G. Durrelluses an innovative Postmodernist style, recounting a set of events experienced by the same protagonists but from different perspectives. Each book reveals a little more of the whole truth of the matter, and ends in a death. The overarching themes centre on love, lust and politics. The novels are set just before the Second World War in the exotic city of Alexandria, with its ancient Egyptian and Hellenic overtones. The main characters include Darley (the narrator and a poet), his mistress Melissa, Justine (a free-loving Jewess) married to Nessim, Clea, Pursewarden (the brilliant novelist) and Mountolive (the British Ambassador). Together and individually they express the full range of passions, emotions and in some cases perversions. 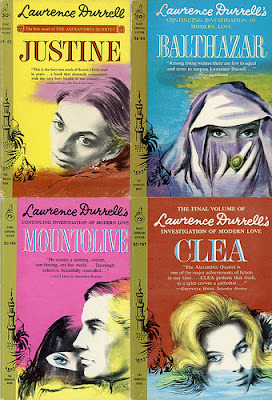 Durrell's use of rich, exotic and even extravagant descriptions make this read a sumptuous banquet. Two fortunate events occurred in 1935 that changed the course of his career. First, he persuaded his mother, siblings, and wife, Nancy Myers, to move to Corfu, Greece, to live more economically and to escape the English winter. 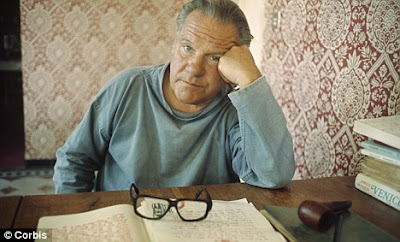 Life in Greece was a revelation; Durrell felt it reconnected him to India. While in Greece, he wrote a plan for The Book of the Dead, which was an ancestor--though it bore little resemblance--to what may be his greatest literary accomplishment, The Alexandria Quartet. Second, Durrell chanced upon Henry Miller's Tropic of Cancer (1934) and wrote Miller a fan letter. Thus began a forty-five-year friendship and correspondence based on their love of literature, their fascination with the Far East, and their comradeship in the face of personal and artistic setbacks. After six years in Corfu and Athens, Durrell and his wife were forced to flee Greece in 1941, just ahead of the advancing Nazi army. They settled together in Cairo, along with their baby daughter Penelope Berengaria, who had been born in 1940. In 1942, separated from his wife, Durrell moved to Alexandria, Egypt, and became press attaché in the British Information Office.